The Civil War reenactment always draws large crowds during the battles. 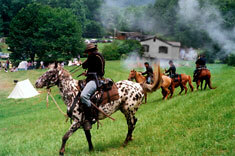 The Civil War reenactment held on the weekend draws many from across the festival grounds. The resounding echo of cannon fire can be heard and seen throughout the valley in the shadow of Snake Mountain. Mounted Calvary, right, and lines of foot soldiers, right, are set against the beautiful mountains and hills of Tennessee.